Incorporating learning centers into our classroom provides an environment of choice and opportunity. At Kinder-Gan there are art, science, blocks, computers, holiday, dramatic play, writing and math/manipulative learning centers. Additionally the cozy corner provides an area dedicated to books and quiet time. All learning centers are amply stocked with fun, educational material; varied to reflect classroom themes presently being explored. Learning center materials challenge the children’s development and interests. Integrating every learning style in the Kinder-Gan curriculum provides each child with the tools they need to succeed. Creative movement, music, and drama enrich the classroom. Through these and other activities the children learn, develop and grow. Special visitors to our classroom, including doctors, musicians and artists, and an exciting schedule of field trips give the children special access to the world around them. Exposing children to a rich and meaningful Jewish heritage gives them a deep appreciation of their history. Hebrew language and alphabet instruction combined with song and dance, Torah stories, Jewish Holidays and traditions make for the most opportune learning experience. 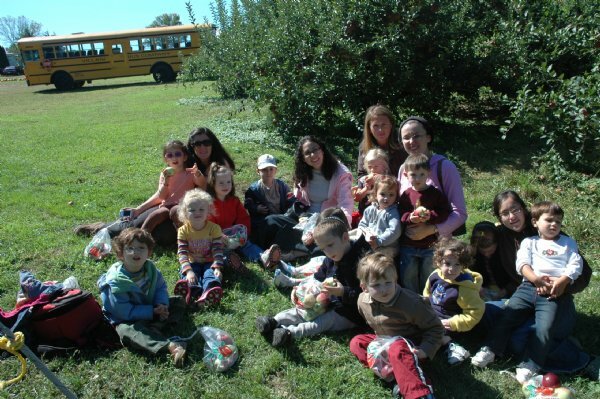 The excitement can be felt as each child develops a sense of Jewish identity. Weekly newsletters encourage family involvement. Offering information on current classroom learning themes as well as important announcements these newsletters are vital to good parent-teacher communication. Parental involvement is an important part of the curriculum at Kinder-Gan preschool. Fun annual events such as Family Shabbatons, Chanukah party, Passover Seder, and weekly Shabbat parties keep parents involved and allow them to share in their child’s school experience.